Saltburn-by-the-Sea is the proud home of the last remaining cast-iron Victorian Pleasure Pier on the North-East Coast and through a process of neglect and eventual demolition of the Coatham and Redcar Piers a few miles North of Saltburn it now stands alone as the most Northerly surviving pier in England. In 1867 the Saltburn-by-the-Sea Pier Company was established by John Bell, Edmund Grove and James Taylor with the intention of petitioning the Board of Trade for permission to construct a pier at Saltburn, a mere six years after the first train had disembarked it's passengers in the town. In 1868 the company was confirmed and granted special permission by Parliament via "The Saltburn-by-the-Sea Pier Order", amending the earlier "General Pier and Harbour Act, 1861". It shared it's founding date with two other piers of which, Clevedon survives and Morecambe Bay Central was lost to fire in 1991. The surviving Clevedon Pier, on which construction commenced the same year as the pier at Saltburn. demonstrating that the concept of a pier for the sole purpose of pleasure and leisure was still developing in the Victorian mindset, which is unsurprising given that England's first cast-iron pleasure pier at Southport had only opened to the public in 1861, a mere seven years prior. Local railway engineer and entrepreneur in his own right, John Anderson, was hired by the Directors to both design and oversee the construction of the pier and the cliff lift that was planned to enable tourists to reach it from the headland. Margate Jetty the pioneer of the cast-iron pier, after which Saltburn Pier was modelled. The design itself was based on the innovative Margate Jetty design by Eugenius Birch, which used iron-screw piles to provide a much more resilient base support for a metal frame and a wooden deck. In choosing this design Anderson ensured that the pier would survive the ravages North East coast. The Pier's cast iron-screw piles that have supported it for over a hundred years. The cost of building the pier was financed by the establishment of the Saltburn-by-the-Sea Pier Company, which was to issue 1,500 shares at cost of £5 per share (approx. £228.50 in todays prices, bringing in capital of £7,500 (£342,750). The founders estimated to the Board of Trade that the construction of the pier to 1500 ft would cost £6,650 (£303,950) and requested permission to take a loan of some £2,500 (£114,250) to contribute towards the cost of the construction whilst shares were sold. In keeping with the heady days of Victorian entrepreneurship the founding Directors of the Saltburn-by-the-Sea Pier Company were so confident in obtaining approval for the pier that work started on designing and specifying the pier prior to permission being granted for its erection. The first order of iron for the construction of the pier from Messrs Cochrane and Grove at the Ormesby Foundary arrived in December 1867 and the first pile was driven on 27th January 1868 by Mrs Thomas Vaughan of Gunnersgate Hall, the prominent ironmaster's wife. Victorian exuberance was held back by practical constraints: permission being granted for the pier that April and the required coastal footings not being transferred until July that year. The pier was eventually completed around May or June of 1869. Reports conflict but all point towards over 50,000 people paying the promenading toll to use the pier during its first year of operation. Due to this early success the company was able to announce by 1873 that its share offering was fully subscribed and a dividend was paid. A working gas lamp from Saltburn Rail Station in 1979, similar no doubt to those that the Saltburn-by-the-Sea Pier Company had installed in one of their first improvements to the pier, designed to extend its useful opening hours. The 1500 ft pier originally had a steamer landing bay and a band stand at its far end, where bands would play as steamers arrived from Hartlepool, Middlesbrough and even as far a field as Scarborough. Flushed with success they decided to press ahead with the saloon intended for the pier head. But the 1870s were very different from the 1860s and two years dragged on with little progress being made until 1875 when the twin forces of a slump in the economic outlook slowed development in the town and a catastrophe struck bringing an end to their plans. The Pier was bought and sold twice in the 1870s finally ending up in the hands of the Middlesbrough Estates in 1881 following the death of Henry Pease and the winding-up of the Saltburn Investment Company, who were to prove prudent investors for the next sixty years. In the 1880s the cliff lift was replaced with a new inclined, water-powered tramway. The pier head itself was widened, a band stand built, returning some of the glory it lost in the 1875 catastrophe. The circular kiosks were replaced with new larger buildings to match the tramway. In 1887 the Middlesbrough Estate showed further confidence in the pier's future by installing "new fangled" electric lighting, which replaced the flickering yellow glow of gas lights and under the glare of electric lighting the pier prospered until the end of the century. The ownership of the pier passed in 1938 to Saltburn and Marske-by-the-Sea District Council who purchased the pier from the Middlesbrough Estates for £12,000 (£344,640) and the pier finally passed out of private ownership and into the hands of the state, which was to prove a turbulent relationship over the next sixty years. Standing as it does on the North East coast the pier is at the mercy of the sometimes vicious, turbulent North Sea or German Sea, as it was known in the 19th Century, disaster was often only a storm away. Over the pier's 132 year history the pier has withstood these violent storms but perhaps more dangerous than storms was the threat of ships, as seen above, which wrecked the Redcar and Coatham Piers. After only a handful of years in profitable operation Saltburn Pier experienced its first catastrophe on the night of 21/22 October 1875 when a storm ravaged the coastline and swept away the pier head, steamer landing bay and 250 ft of the end of the pier. This put an end to plans for a saloon at the pier head and the repairs took two years to complete, with their pier being reduced permanently to 1250 ft in length, the steamer landing bay being removed entirely and the plans for a saloon abandoned. The cost of the repairs bankrupted the Saltburn-by-the-Sea Pier Company and in December 1879 the company was wound-up and the pier and hoist were sold at auction at the Alexandra Hotel to the Saltburn Improvement Company for a mere £800 (£38,648). The Ovenbeg Schooner wrecked off the Saltburn Pier by a storm on the evening of 8th May 1924. Storms did not relent over the night of the 7th May 1924 and the Ovenbeg Schooner collided with the pier and destroyed a 210 ft section of the pier. Initially Middlesbrough Estates decided that it was too costly to repair the damage done by the "Ovenbeg" and the gap on the land side of the pier was fenced off and the pier re-opened to visitors. 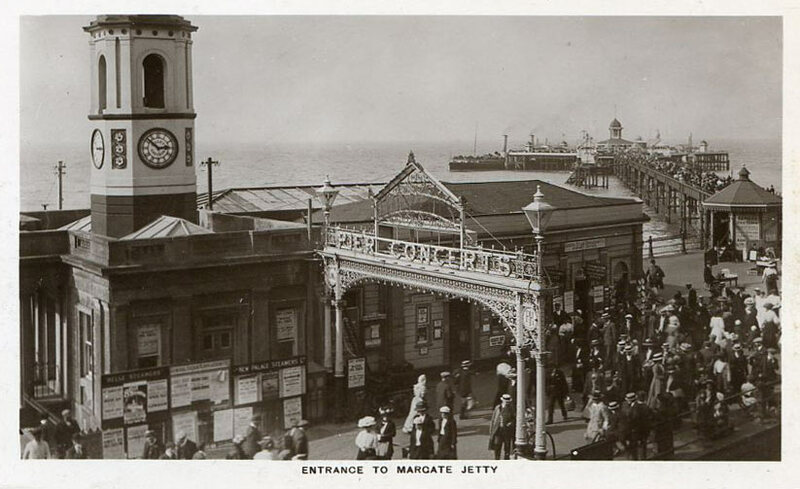 Five years later in 1929 it was announced that the pier was to be repaired and a dance hall built at the entrance to the pier. Repairs proceeded quickly and by 1930 the pier was re-opened at its full length. Despite the North Sea being one of the principle battlefields of the Great War (WW1) Saltburn survived largely unscathed. On 21st April 1917 the HMT Ruthin Castle, built by Smith's Dock Co Ltd of Middlesbrough and commissioned into service by HM Admiralty in 1917 as a minesweeper, was sunk off Saltburn by a German mine. Nine sailors lost their lives that day. To see their names click here. This bell was recovered by divers Carl Racey and Andy Jackson in June 2003. The second World War was much more devastating to both Saltburn and the pier. As a precaution in 1940 the pier was section to prevent it being used as a possible staging post for a Nazi invasion, which involved blowing gaps in the structure to render it unusable. Due to the shortage of steel after the war the pier remained closed until 28th December 1951 when the Council announced in the Evening Gazette that it had secured a £7,000 (£159,460) loan from the Ministry of Transport to re-build the pier, which re-opened in 1952. The pier has seen many personal tragedies and losses over the years, perhaps the most notable of which was the drowning of Miss Kathleen Elizabeth Mary Cooper Abbs of Mount Grace Priory in the winter of 1974. See the Private Eye report of her death here. Miss Cooper Abbs, aged 74 years, drowned whilst swimming around the pier in an effort to raise money for two local churches. In death she continued her good deeds donating a large portion of her estate and her significant book collection to the nation. The restoration of Saltburn Pier in 1952 following the sectioning in WW2 proved short-lived as the pier was struck by another violent storm in 1953 and restoration was not completed for another five years, with the pier re-opening fully in 1958. For the next twenty years the pier was beset with problems and steep repair bills, which the council begrudgingly paid. Often resulting from storm damage, some it has to be presumed from the mismanagement from contractors given that the pier had survived many storms in the prior century. The situation reached a head in 1974 when the pier was taken over by the newly created Langbaurgh Borough Council. Following stormy sessions in the council chamber on 22nd July 1974 the council's committee recommended that the pier should be pulled down. ...condemning the pier. They never had the slightest intention of saving it. A campaign was launched by Ms Collins, the Saltburn Residents Association and the town's Sea Anglers Association. They found a champion in Leon Brittan QC, now Baron of Spennithorne, MP for Richmond. He held talks with the Ministry of the Environment and an application was made to the Historic Building Association, then responsible for listing buildings and later that year retrospective Grade II listing was granted from 20th May 1974. This prevented the council's immediate intentions of demolishing the pier and over the next five years campaigners and the council played a game of cat and mouse, with the "Save the Pier" campaign finally being successful with a permanently shortened pier re-opening on 29th July 1978. In 1999 after extensive collaborative work between the Friends of Saltburn Pier and Redcar & Cleveland Borough Council secured a Heritage Lottery Grant of £1.208 million, plus £600,000 from the council, to restore the pier to its original appearance albeit at its shortened length of 618 ft. The pier was re-opened on 13th July 2001 by then Secretary of Sate for Culture, Media and Sport, The Rt Hon Chris Smith MP. It's status was also raised from Grade II to Grade II* Listing. In October 2005 Redcar & Cleveland Borough Council with the sponsorship of the European Regional Development Fund, Heritage Lottery Fund, Saltburn Improvement Company, Tees Valley Coastal Arc, Friends of Saltburn Pier, One North East, Tees Valley Partnership In Action, Camfields and Groundwork South Tees completed the £380,000 installation of a new lighting system for the Pier and Cliff Lift. The lighting system was the first phase of a scheme for the town heralded under the "Lighting our Culture" initiative. In April 2006 the lighting scheme, designed by Michael Phillips of the Lighting & Design Consultancy, won a Lighting Design Award in the lighting transportation catagory. Fabulous warm colours on the Pier building contrasted well with the blue lighting along the Cliff Lift tracks and white lighting over the sea, making tidal waters appear to seethe and boil below the pier. Sincere congratulations to Saltburn – Yorkshire's only surviving pier and a worthy winner.